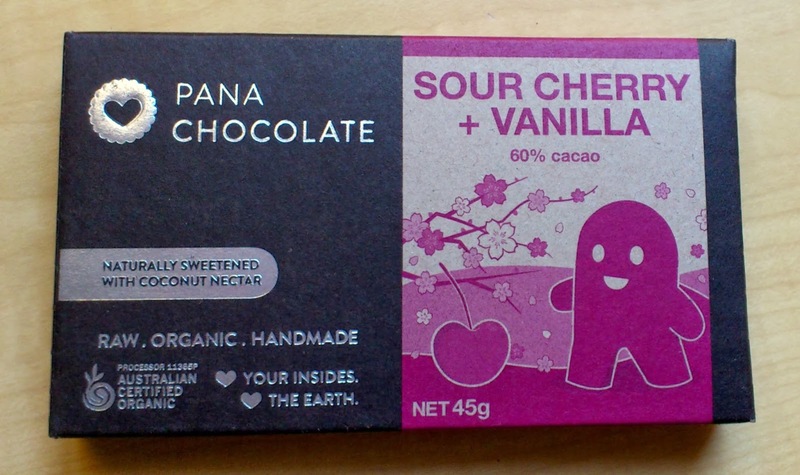 In my kitchen, there was this sour cherry and vanilla flavoured Pana raw vegan chocolate. This flavour only recently appeared in shops near me, but I loved it on sight. Happily, I loved it on taste too. It might even surpass the coconut and goji Pana chocolate that I mentioned in my March IMK post. In my kitchen, there are the first lemons from our lemon tree! The above photo doesn't really capture how small they are. They are very small, but I am delighted by them anyway. In my kitchen, there are tomato salsa flavoured almonds. I usually buy plain almonds and make any seasonings / coatings at home myself, but as these are new to where I buy my bulk foods, I thought I would give them a try. They probably aren't my favourite nut flavour, so I probably won't buy them again. In my kitchen, there are blueberry flavoured lupin cereal stars, also from my local bulk food store. Lupin purportedly has many health benefits, but I will confess to buying these for their shape. I might prefer the non-blueberry flavour in future, but otherwise, these are rather fun for snacking on. In my kitchen, there are many blocks of dairy free chocolate from Woolworths. For some reason, these were being sold at about one-third of their normal price. Given they're well within their use by dates, this may signal the brands are disappearing. I hope not, because I use the Sweet Williams chocolate for baking. In my kitchen, there is a (deflated) tent. This is in preparation for our plans to go camping next weekend for two nights. I have never been camping outside of school trips, and am a little uncertain of how I will cope with no running water or bathroom facilities. However, there are now only 6 months before our planned move to England, and so embracing Australia in the mean time is a priority. I shall let you know how we get on after the event! Goodness life just seems to be one holiday after another for you :-) Hope you enjoy being in a tent - I would like to do a bit of camping but E is even more clueless about it than I. Hurrah for lemons from the tree. Our lemon tree is not great - I have been out cutting off gall wasp branches today :-( I hope they don't stop the sweet william range because I have used it occasionally and find it useful when I want dairy free - but also because it would be a shame if they replace it with their own range which Woolies in particular seems to do a lot - I don't mind their own range so much as them not giving a chance to other manufacturers. As for Woolworths, I know exactly what you mean and it frustrates me hugely. I noticed on the same weekend shop that they now have their own brand of flavoured tofu that comes in pretty much the exact same flavours as the Soyco brand has offered for years. At the moment they still have Soyco (although they dropped their plain flavour a while ago when they introduced their home brand one) but I fear it won't last long. Hmph. That is certainly true. My friends now seem to be up to second babies so I am realising more and more how much more time I/we have compared to those with growing families! Love the little lemon! And it is your OWN produce- that makes it HUGE! Your kitchen is full of goodies- thanks for sharing! Plus, I think their white chocolate block is the only vegan white chocolate readily available! I may lose the capacity to make my white chocolate chip and cranberry Christmas cookies! ekkkkkkkkkkkkkkkkkkkk that would be AWFUL! Oh yes, I think I have seen that bar at Big W! Thanks for reminding me :-) And that is excellent news that they are doing new flavours - that would explain the mass clearance and is exciting to boot! I prefer smoked almonds to tomato salsa flavoured, so you probably have the right idea :-) And yes, despite my purported love of colder climates, that love does not extend to colder climates whilst in a tent...Australia is definitely a better place for camp experiments! The mango may be expensive but it looks delicious! 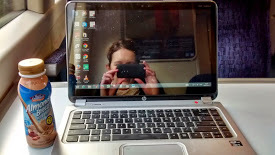 I am joining you next month without fail! Woot woot woot! Six months eh?! Time's a-whizzing by! No need to stress about Sweet William disappearing, m'dear. You'll be in the land of Montezuma's soon. WOOT WOOT. The only mangoes I've seen so far have been rather sad, can't wait to see the ones you have arriving on the east coast! Our west coast ones will get better too, but hopefully they will wind there way to you soon so you can share the enjoyment now! I dont much like flavoured things unless you make them yourself. I am sure your nuts are better. I always love to drop by here and see all the interesting ingredients you use. I never notice them at the shops. Thanks Lisa, and I'm glad you're enjoying mangoes already too. They're too good to wait for! I managed to buy a whole lot of fruit at a road side market. So amazing! 6 mangos for $20. I adore mangoes and love them plain or added to overnight oats. I buy things in bulk too, you just never know how long it will be before you can't find it anymore! I almost feel guilty admitting that our mangoes are $2 each and we have a couple every morning. I just love them. Today we mixed in a bit of rockmelon and a sprinkling of blueberries. Never before have I eaten blueberry flavoured cereal. Is it good? Congratulations on your first lemon. G'day Kari! Thank you for this month's kitchen view! I have never had Lupin, but seems to be a superfood and love mangoes in any recipe too! I'm yet to try my first mango o the season. Can't wait. I love mangoes and can't wait for the season to commence in earnest. I have been making soy coated almonds a lot lately - love them. It really turns plain almonds into something gourmet, doesn't it? I need to make my own coatings at home more often! Yes, you see the first wink of summer and you can't help yourself! I've resisted the mangos (so far) but have weakened at expensive cherries. How wonderful to grow your own lemons - no matter how small. Mangoes over here are expensive and usually very disappointing.